This rather gorgeous pair of bright red lips was made by Lazerbuilt Ltd as their model 109 'Lips'. The upper lip is the telephone handset. It's the real thing ! 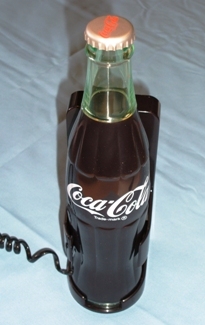 Here is a Coca Cola bottle telephone made by Arrow Trading Co Inc., as their model 5000 bottle shaped one piece full feature electronic telephone. The whole bottle is the telephone with the ear piece being about half way up and the mouthpiece at the base. 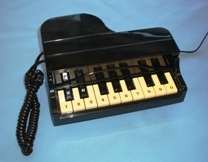 The keys on this lovely piano telephone each play a different note which makes calling someone a musical experience. It also allows you to practice playing when the phone is not in use. 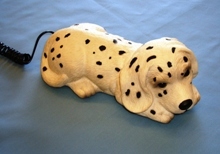 It was marketed as model: PP-100PT, the 'Painotel'. A rather nice model of an inter-City 225 class 91 locomotive that operates on the East Coast main line. It was madeby Geemarc and when the phone rings, the headlights also flash. Here we have a Dalmatian puppy phone. Yes, the ring tone is a dog barking which progressively gets louder. 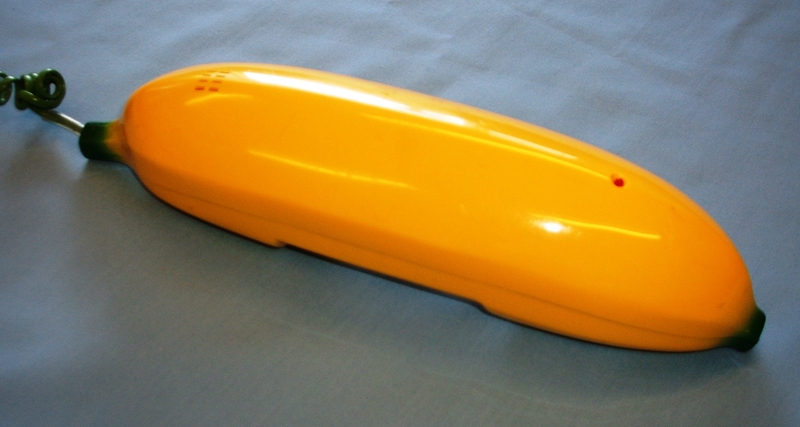 This one piece telephone is shaped as a banana - a very large banana! This frog phone hinges at the base to open out as the telephone handset and to reveal the keypad. 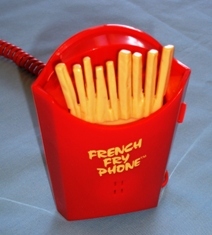 Here is the French Fry Phone which has a drop down flap at the back behind which is the telephone keypad. 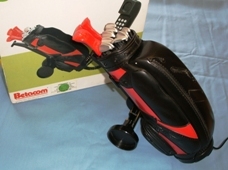 This golf bag phone is made by Betacom and comes complete with its own trolley. The telephone handset pulls out of the rear of the bag and has golf ball shaped push buttons on the keypad. Merchanising from comics, cartoons and films has been extended to include telephones. 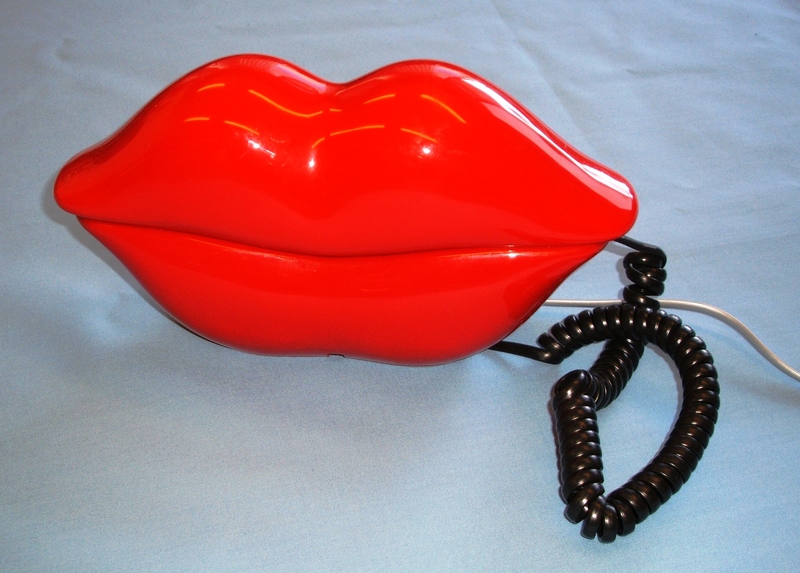 Here is a selection of novetly telephones that are themed on famous fictional characters. Here we have a telephone made into the Batmobile that appeared in the 1989 'Batman' and 1992 'Batman Returns' feature films. This is a one piece telephone that has the keypad, mouthpiece and ear piece on the underside the vehicle. 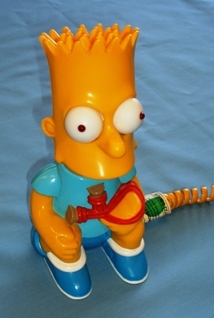 This novelty telephone is of Bart Simpson and was manufactured by Tokai. The telephone keypad is in his back and revealed by a drop down flap. 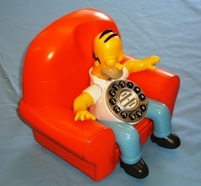 This novelty telephone features Homer Simpson seated on a chair. It is animated in that when the phone rings Homer raises his arms, throws back his head and speaks one of several messages! The telephone handset is actually the top of the chair which lifts off.